Located 12 miles (19 km) east of Edinburgh. 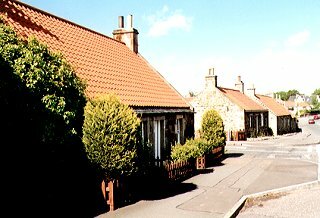 This village was not developed greatly until 1916 when building began on 20 cottages by the Scottish Veterans' Garden Cities Association. Previous residents had worked at coal mining (from the 16th Century until 1924) and weaving. The railway station (1845) is still in use though primarily for commuters to Edinburgh. Important buildings include Longniddry House (early 18th-century), the Golf Club House (1929), and Gosford House (1790 to early 19th-century) by Robert Adam (1728-92) and home to the Earls of Wemyss and March. There is a long (6,219 yards) 18-hole golf course at Links Road.